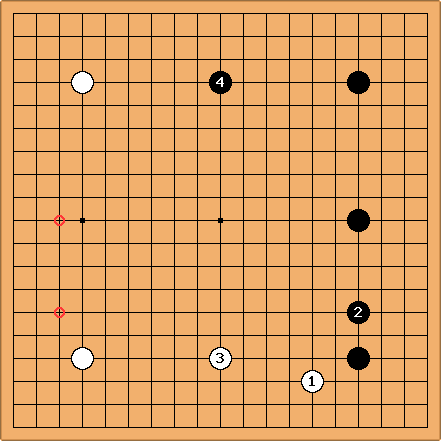 Of all the opening formations in go, the sanrensei is one of the most celebrated. And it has whole books devoted to it, unlike steadier openings (the regulation fuseki, the orthodox fuseki). How good is it, though? I was interested in the latest numbers I could find. One should distrust crude statistics, but database search becomes better with each passing year. A few years ago I concluded that pros had narrowed down the use of sanrensei with Black to half-a-dozen cases. 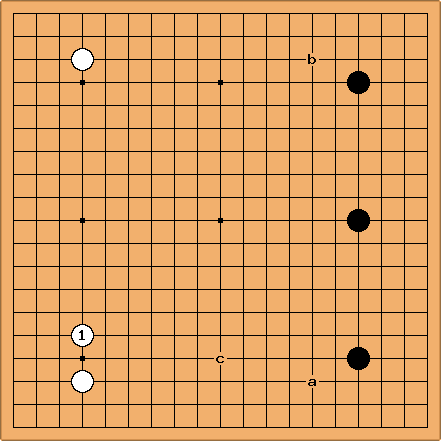 That is, when and form nirensei, with some white formation on the other side of the board made with and , Black has a choice of creating sanrensei, or intervening on the other side (the left, as is usually portrayed). To get a manageable survey, let's start by looking at those cases, where sanrensei is still often played. To use the short notations at side patterns, they are White's HH, HS, SS, H+pK, S+pK and K+pK. These look all right, at first sight. Bearing in mind that Black had been winning something over 50% of games on average, until the recent rise in komi, 60% is unusual, but around 53% or 54% isn't abnormal. After sanrensei, small high enclosure from the komoku stone, Black wins 50% only. This already has a page sanrensei versus hoshi-sansan fuseki. But after sanrensei, approach from the hoshi stone, Black wins less than 50%. After sanrensei, small high enclosure from the komoku stone, Black wins noticeably less than 50%. Here sanrensei has been played little in the past decade. After a corner approach Black wins less than 50%. 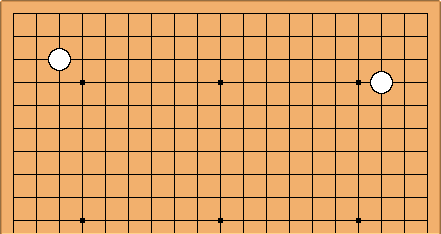 After sanrensei, approach a corner, Black wins less than 50%. This is the paradoxical case. 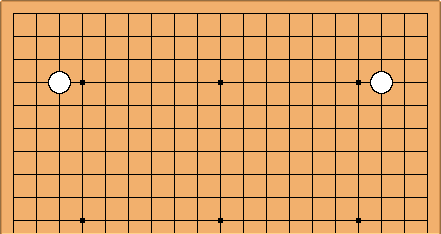 After sanrensei, approaching a corner is the widest path, but Black's winning percentage then rises above 50%. This obviously bears more detailed analysis. Apart from the final case, I do think it looks as if in general satisfactory plans for White have been found. This is quite marked in the numbers - not just a quibble about a few percentage points. Almost as if joseki have been found. There are of course two dozen other formations for White that might occur for and ; I doubt they play a very prominent part in the contemporary theory, but anyone thinking otherwise should by all means post something. BobMcGuigan: In the paradoxical HH case, is it possible that White's lower success rate is related to the well-known principle that White is at a disadvantage in a moyo race? All the other cases have White making a territorial move as one of her first two. Charles I certainly think that's why it is plausible for Black to play sanrensei against nirensei. It's all pretty deep, but if White doesn't want to get involved in the all stars opening, White blinks first. There is an older page (nirensei v nirensei statistics, cf. nirensei v nirensei) here about that case; but I want to look at it again in further detail. Actually what I wrote requires clarification: I think I misinterpreted my notes. This is the 'popular' continuation. But after , Black wins fewer than 41% of games, while success with HHH (sanrensei) v HH runs at about 47%. There is however the puzzling observation that if is at one of the circled points, Black has much greater success. But these aren't much played, recently. The statistical method hits a brick wall here. HelcioAlexandre - I usually play K+pK against San Ren Sei because it doesn't give Black a really good follow-up to his San Ren Sei stones. On the other hand, any Black corner approach will give White a good pincer. Charles You mean against nirensei? HelcioAlexandre - Yep, against nirensei! And if Black goes for sanrensei I play this way (see next diagram), keeping his formation under control and setting up my own framework. In it, a would be the next good move for the sanrensei formation but it doesn't seems to have a good relation with . And also, a move around b is bigger, but it would give a good pincer for White. So c might be played, but it doesn't develop the sanrensei. Charles This example is interesting, in relation to current rec.games.go debate on the use of statistical analysis. This choice of had a winning rate of nearly 70%; but is apparently less played than of the previous diagram (42%). Clearly this choice of allows Black an omoyo plan. HelcioAlexandre I liked this move. It makes a and b miai. 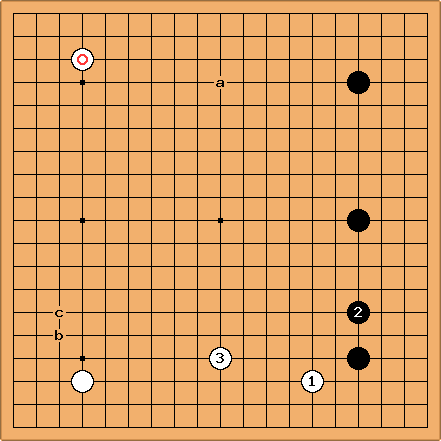 A move at c is big, but if black plays there, white shimari controls black on this side even better than the marked stone in the previous diagram. I'll study some pro games with it to see the ideas. Any good pro game as a reference? Fhayashi: Some of these haven't been explained at side patterns yet. Charles Yes - but they should be guessable. I'll add more later. In this case using some notations can keep brevity. Fhayashi: I agree, shall I move it to side patterns? Charles No, leave these as footnotes for the present. It isn't obvious how best to discuss these matters - diagrams in the main text can make it look a bit longwinded. Fhayashi: I like your nomenclature. I saw some I didn't recognize, so I went to the side patterns page to look it up, but it wasn't there, or at least there was no diagram for some of them. If each pattern had a figure in side patterns, this is a non-issue. Charles Sure - that page is work in progress, too. Amazing to me that there isn't a standard of nomenclature; but I think that's the case. I'll add more side pattern names as things turn up to discuss.